as a child I had dreamed of being a bride and i would always wear one of my mother's long slip dresses and dance around the living room. the dream of becoming a bride finally became true in 2014.
one year ago Tee and i got married in the beautiful baroque rooms of castle Laxenburg in Austria. just like any other wedding there were some things that went smoothly and some that could have been planned better. as beautiful as our wedding was we only had one issue. Time. unfortunately everything started with a delay which ultimately lead to more delays and by the time Tee and i were supposed to take some bridal pictures we had only less than 30 minutes left before dinner was served. we had to rush everything and in the end he and i were only able to pick a few couple pictures together. i personally didn't have any bridal pictures of my own and even the second time around when we threw a second wedding party in Montreal there was just no time to take these extra shots. as our anniversary was approaching Tee asked me a few weeks ago: Honey, what do you think if I take your bridal pictures? i was all excited about the idea but I was just a little bit sad about the fact that i left my princess gown , the actual wedding gown, in Montreal when we moved to Houston. Luckily i still had my other bridal dress (which was designed by my good friend Erik Lu) that i wore for our second wedding celebration even though the style is completely different. 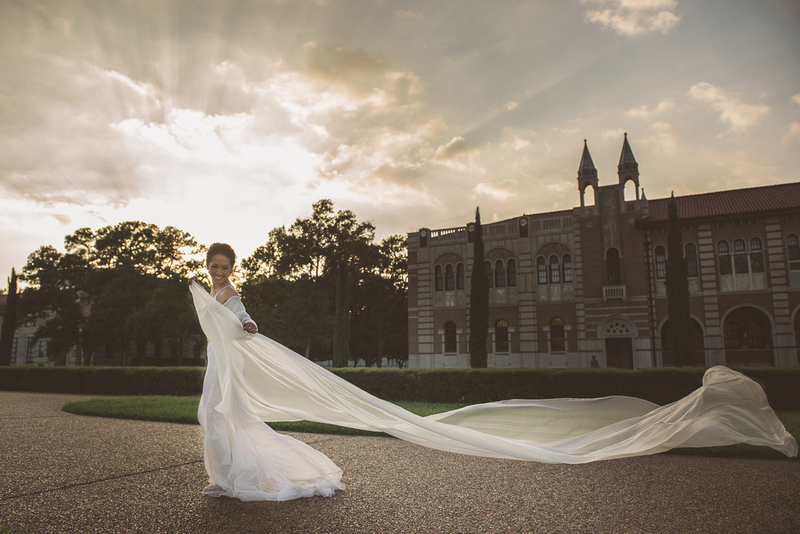 we picked Rice university as our location because of its' beautiful architecture and also because it kinda reminded us of Vienna. and so finally in 2015 I was able to dance around in a real wedding gown just like i've always imagined and dreamed of as a child....i just never thought that it would be my own husband who would take these photos but that's exactly what makes these pictures here incredibly priceless.